HTML/CSS inspector similar to Firebug, which allows easily to correlate the selected elements of page with a code and proper style. SQL manager allows to produce all necessary actions with a database – to add, delete, edit a structure and records in tables, to export data, execute SQL queries. Highlighting and auto-completion works for SQL files also. 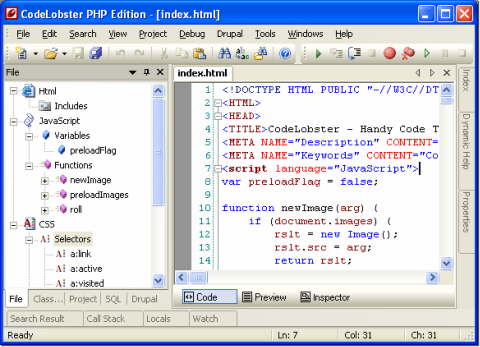 The portable option allows to use editor without installation. Other useful utilities: pair highlighting, possibility of blocks selection, collapsing, tool-tips, navigation on descriptions of functions, viewing of structure of files and project, preview in a browser, book-marks, and all other standard possibilities for work with a code. Posted on Tuesday, January 24th, 2012 at 12:28 am and modified by WebMaster View at 5:32 pm. You can follow any responses to this entry through the RSS 2.0 feed. Responses are currently closed, but you can trackback from your own site.